Jorginho (second from left) with team manager Marlon Galea, president Sharlon Pace (second right) and coach Darren Abdilla. 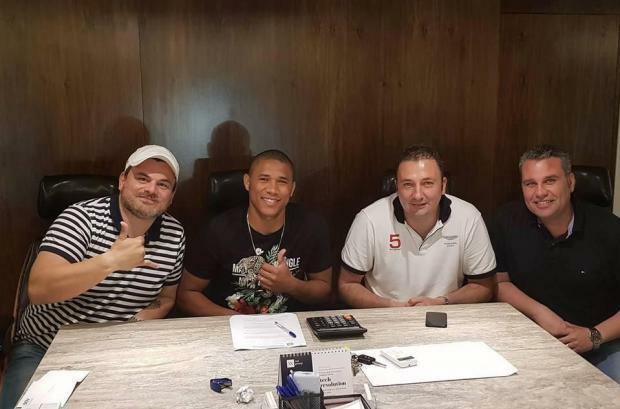 Gżira United's hectic transfer activity continued on Monday as the Maroons announced the signing of Brazilian striker Jorginho. The 32-year-old had been on the books of Hibernians for the past four years, during which he had a spell in the Saudi Arabia league with FC Khaleej at the start of last season. Jorginho returned to Hibs last January but a series of injuries derailed his contribution. In fact he only had nine appearances for the Paola club, with only one goal to show. Despite his recent problems, Gżira United still stepped up their interest in the striker who has scored 84 goals in 160 appearances in the Maltese Premier League. Jorginho reached an agreement with Hibs to end his relationship with the club and signed a three-year contract with the Maroons. The pacey forward is Gżira's third signing in the close season after Rodolfo Soares and Thomas Veronese. At Gżira, Jorginho will rejoin his former Hibs team-mates Soares and midfielder Andrew Cohen.